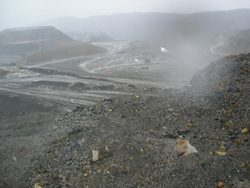 The applications involve mountain top removal coal mining. Explosives are used to get at coal that’s close to the surface. 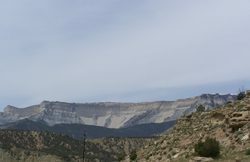 In the past, the mining companies have been allowed to fill in valleys with the leftover rock and dirt. But the EPA is concerned that streams are getting buried and polluted so the agency is now giving that practice a serious second look. Carol Raulston is with the National Mining Association. 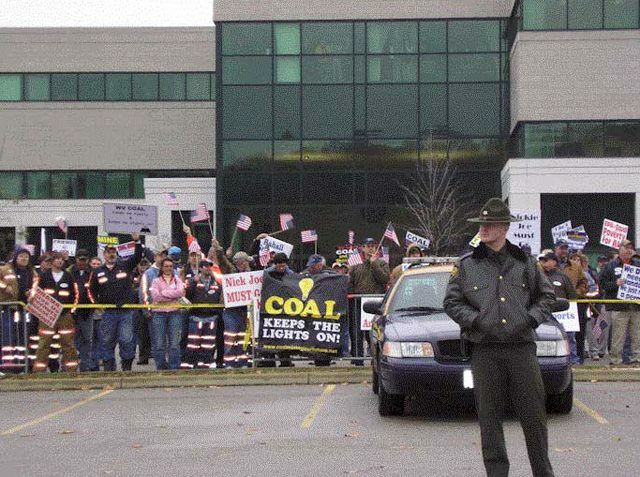 She says holding up those permits have people in the mining towns of Ohio, West Virginia, Kentucky and Tennessee worried about losing their jobs. An EPA spokesperson says protecting drinking water and coal mining jobs are both important. The agency says both can be done. toilet tanks. They wanted to show the black soot covering their cars. Evans brother is a coal miner. He supports mountain top removal. polluting and environmentally devastating type of mining. But Evans says not even her own brother would do an interview about it. permission to talk on camera. use that kind of intimidation to control miners. flipping burgers. And, I argue, that the coal companies want it that way. support for how they treat their workers and how they treat this land. Burning coal pollutes – acid rain, toxic mercury, soot. And lately the big concern – carbon dioxide, the chief greenhouse gas contributing to global warming. The Secretary of Energy, Steven Chu told Members of Congress, despite the concerns about pollution, we still depend on coal for half of our electricity. The technology does not exist today. 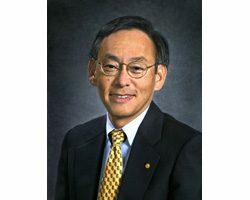 Chu says three-point-four-billion dollars in government stimulus money is now available to find a way to clean up coal. An experimental plant called Futuregen was supposed to find ways to burn coal more cleanly and do something about carbon dioxide emissions. But the Bush administration killed funding. Secretary Chu says the Obama administration is now negotiating with Futuregen partners again. 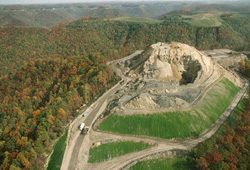 Environmentalists say this is the most environmentally destructive kind of coal mining there is. It blows off the tops of mountains, fills in valleys, pollutes creeks and water supplies. But the EPA does not have the authority to block it with no reason. The agency has to follow the permitting process in place. Oliver Bernstein is with the environmental group the Sierra Club. 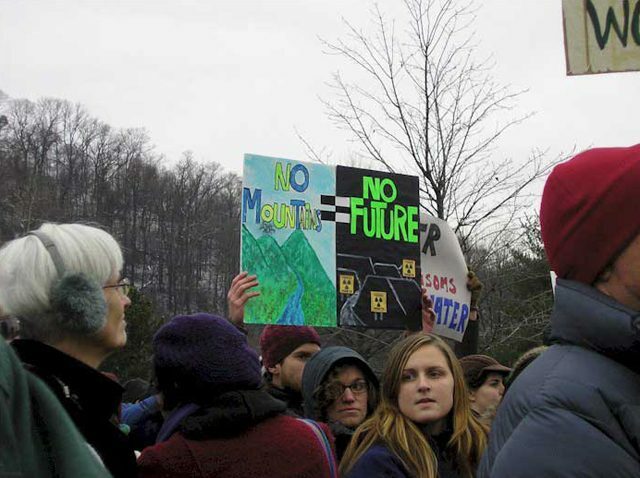 Environmentalists are calling for the White House Council on Environmental Quality to step in and do whatever is necessary to stop the mountaintop removal coal mining. Researchers say warmer temperatures in the last ten to fifteen years have been messing with the ecology in Yellowstone National Park. In the fall, the grizzly bears eat pine cone nuts from white bark pine trees. It gives them a lot of nutrition before they curl up for the winter. But those trees are dying. Mountain pine beetles are killing them. The beetle populations usually get knocked back by cold weather. But it hasn’t been getting as cold. So, there are more beetles killing more trees. Doug Peacock lives near Yellowstone and has written several books on grizzlies. And when the trees are gone, the bears get hungry – they go looking for food – and they run into people. 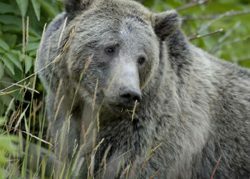 48 grizzlies out of the 600 in the region were killed last year. Some environmental groups are suing the government to get the bear back on the endangered species list. Ross Freeman crawls into a giant recycling container. His legs are sticking out. He holds a long rake and shuffles the cans inside. This is part of his job. Ross Freeman is the eco-steward at Stevens Pass. It’s a ski resort tucked in the Cascade Mountains in Washington state. His official title is “Environment and Sustainability Manager.” Stevens Pass created that position last year, when it wanted to make itself more eco-friendly. John Meriwether is director of planning and environmental services at the resort. He’s worked here for 16 years. Meriwether says ski resorts are pushing more money into fighting global warming. Stevens Pass pledged to offset all its emissions with energy credits. It’s the only resort in the Pacific Northwest that does this. Ross Freeman’s work is on the ground. He drags out furniture that can’t go in the landfill. He recycles rubber wheels from the ski lifts. All this is part of the resort’s efforts to meet the national “green” standards. The National Ski Areas Association has 21 environmental guidelines it wants resorts to follow. 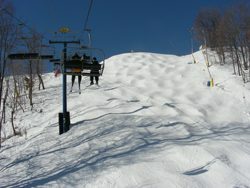 It’s called Sustainable Slopes. The Ski Association says 190 resorts endorse it, including Stevens Pass. Ryan Bidwell is the executive director of Colorado Wild. It’s an environmental group that grades ski resorts. He says endorsing the Ski Association’s Sustainable Slopes guidelines is different than actually following them. Bidwell’s group grades ski resorts on everything from recycling to the effect on old growth forests. So how “green” was Stevens Pass on the environmental score card? But Bidwell says hiring an eco-steward like Ross Freeman is a step in the right direction. Freeman says there are only a few jobs like his. But he hopes more ski resorts will start hiring folks like him when they go green. For The Environment Report, I’m Irene Noguchi.